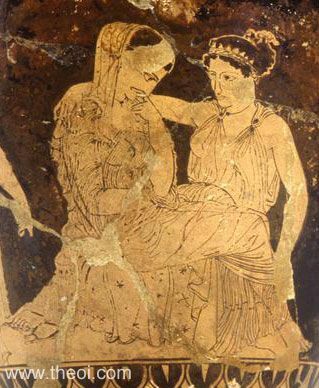 Detail of Aphrodite and Helen from a scene depicting her seduction by Paris. Aphrodite with the help of Peitho (Persuasion) and Himeros (Desire) persuades Helen to elope with Paris to Troy. Nemesis directs Tyche (Fortune) to punish the act.